I got this shot of a long-tailed skipper (Urbanus proteus) a couple of weekends ago, at my friend Dale Clark’s butterfly farm. He does an open house every fall, catching the migrating monarchs as they float through his giant yard planted with nectar and host plants. 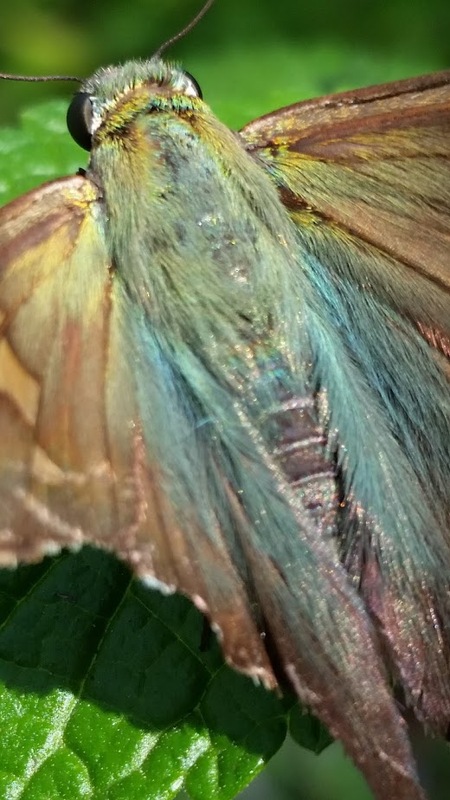 I love the way the light strikes this butterfly’s head and shoulders – it’s almost as if he had a special spotlight that followed him around. I’ve known people like that – wherever they are, they appear slightly brighter than the surrounding area. I think it’s partly an innate thing, and partly an out-pouring of energy – attitude, spirit, whatever you want to call it. I feel like I do it sometimes. I can feel it, when the light is on me – and I feel it even more when I step wrong and I’m out of it. It’s a feeling of alignment, like you’re in the right place and you’re saying the right lines and the show’s going well. It feels like I’m harmonizing, like I’m in tune. Lately, I’ve been out of it a lot. I’m trying; I get bits of it. Occasional moments. I’ve been dreaming a lot, and working on exploring my dreams; this always helps me connect. Hello! I came across your blog while hunting around for silkworm rearing tips and I came across your site and just wanted to let you know that all I read there was informative and interesting. I especially loved the articles on raising other species of silk moths. You put a lot of care into your projects and it really shows! Thank you!Comments like this make my day. I’ve read your blog many times over the past few years and always been inspired by your beautiful work and your writing. Just wanted you to know that it’s greatly appreciated, and valued. You are very generous in sharing your knowledge and I wish you all the best! Kind regards from a fan in Canada.